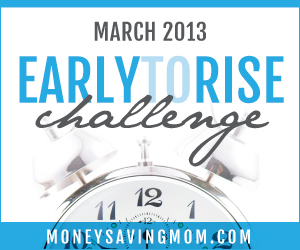 This is Day 14 of Money Saving Mom's Early to Rise Challenge! It's obvious I haven't been doing this consistently (which is actually the subject matter for today! Ha!). It's been a struggle lately and I finally figured out why 2 days ago. In a previous post, I talked about my diagnosis with Graves Disease and all that went before and after that. I struggled so much with almost depression like symptoms and fatigue it was hard to do anything on those days. That was before and during the time we were tweaking my meds to pinpoint my dosage. Things gradually got better and I was able to resume a "normal" feeling I hadn't had for quite some time. It started all falling apart when we were in Georgia. I had some random muscle aches in my arm and really didn't think much of it. I figured it was from the travel and I'd be over it soon. It started progressing to my other arm, my back and neck and eventually my legs and feet. At the very worst of it, I could barely bring my hand to my mouth to take my medicine, and I was still by myself all day wrangling 3 littles. Hubs had to move my arms for me so I could get loosened up enough to move myself. My joints started hurting too. I thought I was having problems with my knee again. I had fractured it about 4 years ago and it took a good year and a half to two years to finally be useful. This time I couldn't bend it much or straighten it fully. I had some swelling but was able to walk on it fine, except for having to bend it. Puzzled the docs sent me for x-rays and wanted to go to the orthopedist. I also started experiencing some of the same depression symptoms I had in the beginning. I told Hubs it felt like I was falling into that hole all over again. 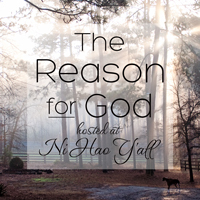 Come to find out it was because my Graves Disease had gotten out of hand. My meds had more or less just quit working. Thankfully I had an appointment and my doc decided to switch meds. I'm now on the the initial med my doc wanted to start with, but my son' pediatrician was not ok with me using while nursing. It's been amazing. I could almost tell a difference within 24 hours after starting it. I'm no longer sore, I can move as soon as I wake up and I don't feel constantly gloomy. I've been giving myself some grace and have let myself sleep when I need to sleep. Rest is so important to me right now. But I also need to not let it go too far and use this as an excuse to not continue on. So today's reading was very appropriate to helping motivate me to get out of bed. I don't know what it's going to cost me yet. Maybe a night of putting the kids to sleep by myself? (One chore I loathe except for the fact I can cuddle them a bit :D) Maybe getting up when the baby wakes up? (He's having troubles of his own in the sleep department :( ) I don't know. I'll discuss with Hubs. What is it costing you to not get up on time? So what time did I wake up this morning? 5:33 am. And I have no picture because I still can't find that camera cord. I really need to get my act together, ya'll.